Lace Up Those Hiking Boots! Trails abound along the entire Byway route. Located on the Sioux River, a first class steelhead trout stream. The park generates heavy bank and stream fishing and offers a spot for picnicking, wildlife viewing, hiking and rugged camping. Take Hwy 13 to County C in Washburn. Go 3 miles on County C to Big Rock Road. The park is 1.5 miles down the road. Follow Hwy 13 approx. 6 miles west of Red Cliff. Turn right (north) on Old Cty Hwy K 1.5 miles. Trails on the west side of the road. Go 7 miles north of Washburn on Hwy 13. Turn left on Hatchery Rd for 1 mile. Turn left on Star Route Road. After 5.5 miles turn right on Henkens Road. Trails are on the west side of the road 1.5 miles north along Henkens Road. 6 ½ miles north of Iron River on Co Rd A, then left on Fairview Rd to Fish Hatchery. Take Hwy C south of Cornucopia 1.5 miles and turn right on Trail Drive to trail head parking lot. Take Hwy 13 west of Red Cliff 3 miles and turn right on Old Cty Hwy K for 3.5 miles. Trail head is the intersection of Old K and Rowley Rd. Take Hwy C south from Cornucopia 3.5 miles. Trail head is on the east side of the road. The narrow trail is well signed. After a short walk (which may be muddy during rainy periods) you'll come upon an ancient riverbed area called Echo Dells. Take your time exploring the rock formations, pools and gravel beds. Try singing your favorite tune and enjoy the cathedral-like acoustics. Further on you'll cross a bridge and follow a narrow path to Houghton Point. 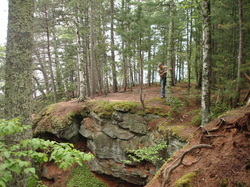 Enjoy the huge old-growth pines and hemlocks, rocky shoreline and views of Lake Superior. Return via the same route. Directions: Drive 2.5 miles north of Washburn on Hwy 13. Turn right on Houghton Falls Road and go 1/2 mile to the Houghton Falls Nature Preserve parking lot.